The American Civil War proved to not only be a period filled with turmoil, but also a time of innovation. The Gatling Gun, ironclad warships, and improvements to railroads and telegraphs are only a few of the innovations that flourished during the Civil War. One of the lesser-known creations was the Coffee Wagon. 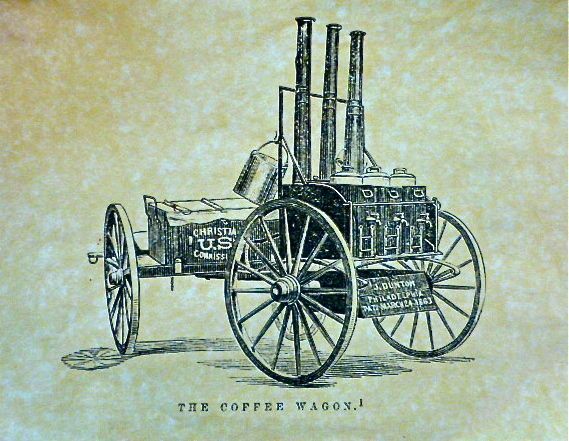 Sketch of a U.S. Christian Commission Coffee Wagon based on the patented design by John Dunton. Coffee was not a particularly popular beverage in America until after the Boston Tea Party in 1773. At that point, as Tori Avey states in her article The Caffeinated History of Coffee, “…making the switch from tea to coffee became something of a patriotic duty.” Coffee’s popularity was encouraged by the Civil War because of the boost of energy soldiers got from the caffeine. During the Civil War, the U.S. Christian Commission (U.S.C.C.) made it their mission to provide different comforts to soldiers during the war, including coffee. The U.S.C.C. made multiple coffee wagons which were based on the design patented by John Dunton on March 24th, 1863. 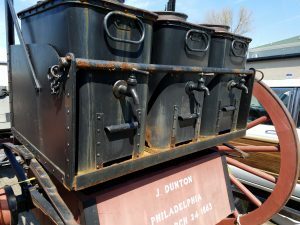 A close-up picture of the main elements of the coffee wagon. Dunton based his design on an ammunition caisson which allowed these coffee wagons to be drawn by horses. The U.S.C.C. would have roasted and ground the coffee beans themselves, which was a bit of a luxury for the soldiers as they typically would have had to roast and grind their own beans if they wanted coffee. The coffee wagon was designed with multiple boiler units. Each boiler unit had its own firebox below it which was attached to its own chimney. Each boiler unit also had a spigot on the front where the coffee would be poured from. The coffee wagon could produce as many as 108 gallons of hot coffee an hour which warmed the spirits of many troops during its heyday. Civil War Reenactors gathered together at Historic St. Luke’s. One of these coffee wagons will be on display at Historic St. Luke’s Church in Smithfield, Virginia during their Civil War Weekend on April 1st and 2nd. The U.S.C.C. coffee wagon will temporarily be on loan from the Armed Services YMCA of Hampton Roads. 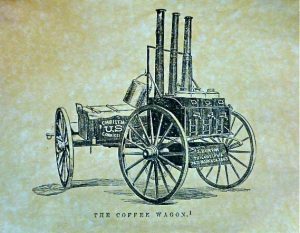 Today, these coffee wagons are very rare, but a few still remain as examples of the amazing innovations that were born during a turbulent time in America’s history. Come check out the U.S.C.C. coffee wagon in person by visiting Historic St. Luke’s Church for their Civil War Weekend on April 1st from 9:30 a.m. to 5 p.m. or on April 2nd from 1 p.m. to 5 p.m. 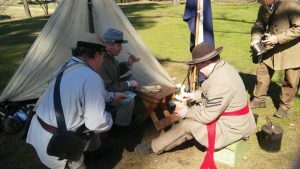 There will be reenactors, demonstrations, period merchants, barbecue, and more!